The VO-LED is controlled by motion sensors. Comes in 2- and 4-foot lengths, with several light level options. Ultrasonic motion sensors trigger the light levels from low to high upon occupancy. Low standby light levels are field-adjustable to as low as 4 watts. 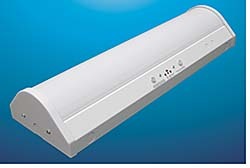 LED modules are rated for more than 50,000 hours.